Repair the sins of summer with Marc Anthony, Vichy, Quo by Orly and Bio-Oil! 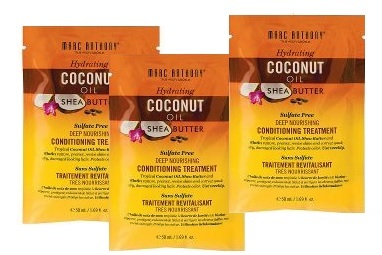 Marc Anthony Hydrating Coconut Oil & Shea Butter Deep Nourishing Conditioning Treatment - 50ml - $2.99 - a weekly conditioning treatment that nourishes dry hair with a blend of coconut oil - with a molecule small enough to penetrate the cuticle allowing it to get deep inside to infuse it with moisture while keeping water out to prevent frizz; grape seed oil - sits closer to the cuticle adding moisture and shine; hydrolyzed keratin - to fill in damaged hair and restore tensile strength to make hair look and feel healthy and soft; shea butter - to keep hair hydrated and soothed; and biotin - for body and shine. Just leave it on for 3-7 minutes to restore, protect, revive shine and correct weak, dry and damaged hair. If you have long and/or thick hair you will likely need the whole packet - for my shorter, fine hair one treatment lasts two uses, so it's a really great value for me! Available now across Canada at Walmart. Quo by Orly Argan Oil Hand Creme - 38ml - $7 - an ultra-luxe, intense hydrating creme for the hands and cuticles that leaves them feeling soft and moisturized which you can easily reapply as often as needed as it's the perfect size to take around with you in your purse! Bio-Oil - 60ml - $12.99, 125ml - $21.99, 200ml - $29.99 - with PurCellin Oil which offers not just a great treatment for scars and stretch marks, but it also works perfectly as a light-weight and non-greasy moisturizer for dehydrated skin - also contains Vitamins A & E, calendula, lavender, rosemary & chamomile oils. What makes it super for layering under your moisturizer (or using it on it's own) is how quickly it sinks into your skin, leaving no oily film behind and it's great for all skin types, even sensitive. Use it on the face, body or even the hair to leave it shiny and frizz free! Available at major retails across Canada.